As folks signed the petition they expressed their anger at the Tories for wanting to bring back fox and stag hunting and hare coursing. Fellow anti-bloodsports activists Julia and Sara joined me in tabling in Hastings Old Town yesterday. 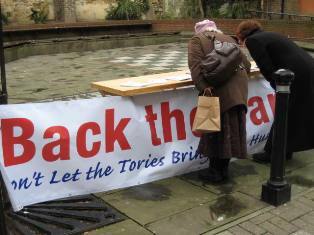 Many people voluntarily approached us to sign the petition after they had read the 10 foot banner, which said “Back the Ban: Don’t Let the Tories Bring Back Hunting.” You can sign the electronic petition here.